How in control are we of the decisions we make every day? How sure are we of our judgement, how we feel, what we believe? I think many people would say they feel very in control and very certain. I suspect many people are wrong. Studies in behavioral psychology have begun identifying the effect of priming–how a subtle stimulus can affect how people, behave or think. The field of priming is not without ongoing controversy, but at the same time the effect of priming has been seen in many studies (like this one) and appears to be a real phenomenon, albeit one that is still very challenging to clearly describe, test and validate. Its in this context that a recent report describing physician prescribing patterns is particularly interesting. And disturbing. 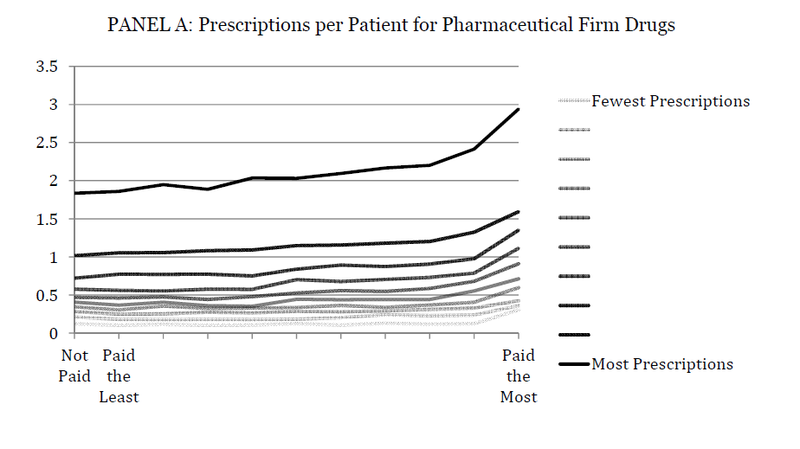 The study by Joseph Engelberg, Christopher Parsons and Nathan Tefft looked at the effect of Biopharma payments to what drugs doctors prescribe. To quote from their introduction for some context: “While such rent-seeking behavior [such as pushing more expensive merchandise by salespeople] might not surprise many people…that financial conflicts of interest could influence their doctor’s advice might be both less expected and more worrisome…intrinsic motivation is thought to be important in medicine, with the goal of optimizing patient health being a paramount objective.” The null hypothesis would be that prescribing patterns would be related solely to health condition, general information about drug efficacy, and price to the patient. That’s not what was found. The differently shaded lines represent bins of physicians ranked by number of prescriptions they wrote, broken into ten groups. Wow. And I’m also sure that for the vast majority of these physicians, if you asked them whether payments affected their prescribing activities at all, they would answer no, they have a clear and transparent relationship with the funding Biopharma and that relationship does not in any way influence their prescribing behavior. So, here we have a correlation between payments and behavior. This does not prove causation of course. It merely suggests something is going on that causes these two elements to track together. It is suggestive, though, and in line with the concept of psychological priming, especially as there was also a correlation with corruption indices and likelihood that a doctor would prescribe a drug produced by a Biopharma funder. This is second correlation between environmental influences, as opposed to internal motivations, on prescribing behavior. However, given the study by Engelberg, Parsons and Tefft, this may not completely be the case. Although the organizations may feel like their agendas are separate and that a clear wall is being maintained between Biopharma donations and patient group activities, it seems a parallel study of funding and behaviors in patients groups would be interesting to do, especially as those groups vary in the amount of funding they accept from Biopharma. This is not to say Biopharma should not contribute, either to physicians or to patient groups. There is a lot of good done with those funds in terms of general education and support for patients’ rights. But now we’re starting to learn more, and know better, than to suggest there is no way Biopharma funding is influencing actions. For the industry to try to keep its image as positive as possible, it needs to acknowledge these possible effects and do whatever it can to make sure priming is minimized as much as possible. This entry was posted in Biotech/Pharma, Business, Knowns and Unknowns, Metrics and tagged bias, EFPIA, PhRMA, physicians payments, prescribing patterns, ProPublica, psychological priming. Bookmark the permalink.